AITS-R (AIS Installation Test Set) is an operational test set operating on AIS1, AIS2 and DSC (channel 70), evaluating the operation of an AIS unit and AIS installation. The design references the relevant standards and recommendations, including IMO SN/Circ.227 and resolution MSC.74 (69), annex 3. Both radiated and conducted tests can be performed. 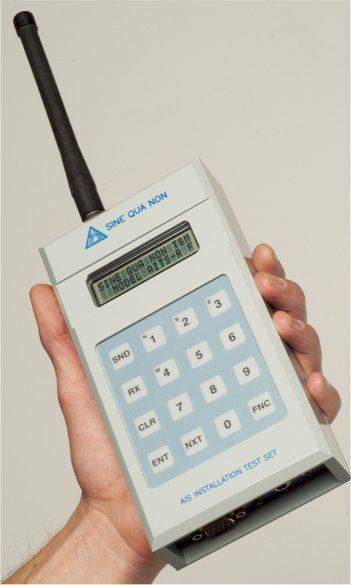 AITS-R is a hand held portable instrument with an internal battery pack and charging circuit. It can also operate using an external 12VDC supply. AITS-R is menu driven, using a 2 X 16 character LCD display and keypad. All menu driven test options are fully automated. Test results can be viewed on the LCD display and can be stored in the AITS-R�s non-volatile memory. The AITS-R can store two separate test sessions, which can be downloaded to a PC at a later stage using the AITS-R utility software. Customized test reports in HTML can be printed.